But before we start, I want to thank again all those of you who support this podcast by first of all, keeping subscribed, also by purchasing Rosetta Stone's software through the link on my site (that really helps), and via PayPal donations. There's another and rather fun way of supporting the show - by getting a little souvenir from my Cafepress. com store. 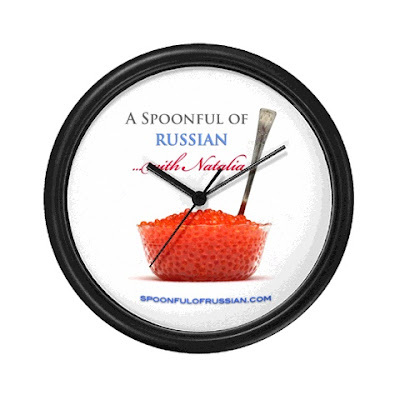 Did you know that they have "A Spoonful of Russian" stamp now? And "A Spoonful of Russian" license plate? Since I enjoy cooking, my favorite is the apron. And what pet can live without "A Spoonful of Russian" T-shirt? The store's ID is speakrussian. Now , for the lesson! Давайте начнём!